Considering how much time I’ve spent afloat, the ratio of fish sizzling in the pan to those still swimming in the sea has remained frustratingly low. Hooking and eating your own catch at sea is healthy, immensely satisfying and free, but without some basic knowledge, is likely to remain a rare treat. I spent a day afloat with Jon Holgate, a competitive angler who has fished for England at international level, to learn the basics of fishing under sail. Jon owns Hamble Danglers, a fishing tackle shop in Warsash, near Southampton, and has been fishing since he was a boy. As we motored out towards the east Solent, I wondered if he had any obvious tips for beginners. 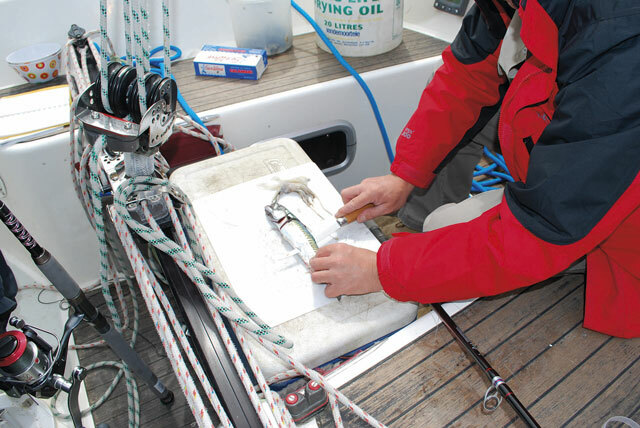 This article focuses on catching bass and mackerel – two of the most common and tasty fish to be found UK waters – while under sail as opposed to sailing purposely to fish. But there’s nothing to stop you pausing en route to your destination at a likely looking spot or sandbank to stock up on your supper, so we’ve included some tips on fishing at a slow drift, too. Rod or hand-line? At the most basic level, you can make do with a hand-line. It’s simple and stows easily. On the downside, it can be difficult to wind in, especially when you’ve hooked a fish or clump of seaweed. Jon recommends a rod if at all possible. ‘Make sure you pick up a rod designed for trolling, as the high loads will be too much for anything else,’ he said. If you can’t fit a full-size rod on board, those designed for kayaks are ideal, as they are more compact. 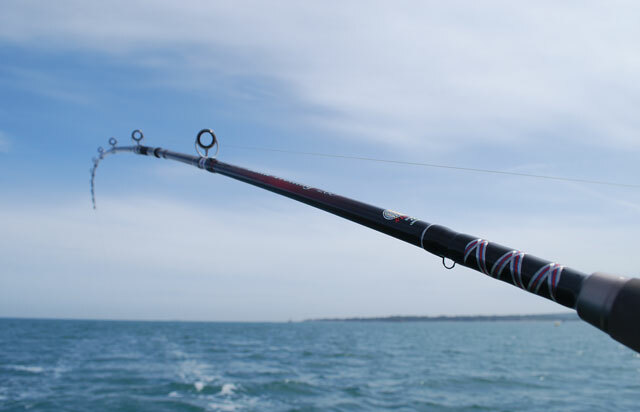 One thing to note, though: if you’re using a rod, tie it on with either a bungee or line or use a rod holder – otherwise if you get a bite it’ll disappear. Which reel you choose is up to you, but make sure you get one that’s compatible with your rod. Your local tackle shop should be able to help. If you’re out for the day, live bait is a possibility. Jon brought some small crabs, known as ‘peeler’ crabs, as well as some frozen squid which he cut into strips. Alternatively, once you’ve caught some small fish, such as mackerel, they can be cut up and used as bait for larger fish. Fish heads are particularly effective. Lures, on the other hand, are much easier to store on board. Bass and mackerel rely on their eyesight and detect movement in the water to feed, so lures, which mimic the movements of small bait-fish, work well and are less smelly and messy than bait. But it’s worth trying both. For trolling, lures are better able to resist the fast flow of water, while bait is generally better for when drifting or at anchor. Different coloured lures are available, depending on the depth you’re fishing at – red light is filtered out at depth, so brighter colours will attract more attention. Your best bet for a good spot is to talk to a local expert – a tackle shop or fisherman – who should have some local knowledge. Seabed features like sandbanks, rocks, ledges and wrecks tend to hold fish, and you can identify these from your chart, making sure that there’s enough depth for your boat. These places can often also be identified by surface indications: swirls, overfalls and eddies generally denote depth changes. Unfortunately these do also pose a threat to sailing craft, and often the worst time to be dealing with a line-full of mackerel is when you’re sailing through overfalls. Sometimes areas of deep-lying, rocky ground – good places to fish – are dotted with crab pot markers. Man-made forts are particularly good areas, especially in a fast-flowing current. 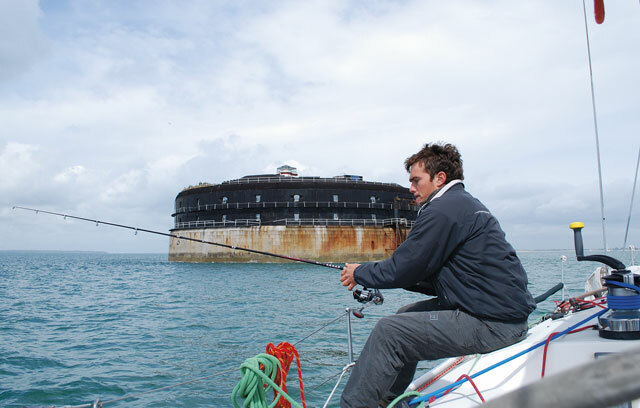 We headed out to No Man’s Land fort in the eastern Solent, and caught three mackerel. The vertical walls and shadows of a fort give fish a good place to feed and hide. Rocky ledges are also good; Jon directed us to Bembridge Ledge, which we drifted slowly over, catching a number of different species, from small pollack to pouting. Man-made markers are generally more reliable than natural surface indications for showing the exact position of seabed features. For instance, the edge of a steep bank is often betrayed by lines of white water, but this may appear some distance downtide of the obstruction, whereas crab pots and channel markers are often directly over the edge. 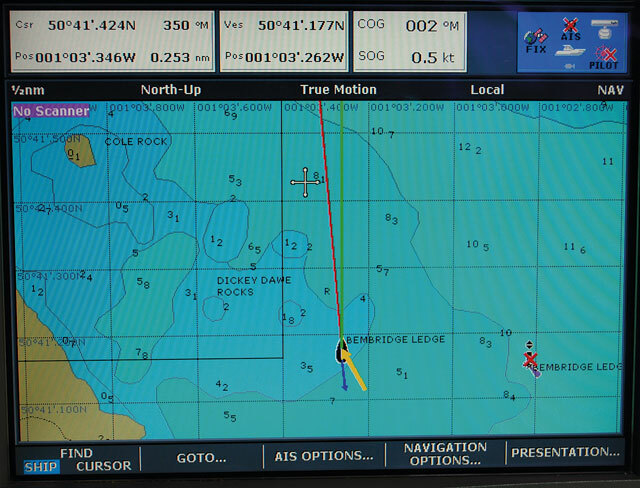 Keep an eye on your depth sounder. The best places to fish are on or near these changes of depth, but there’s no way of telling which will be most fruitful, the shallow side, the deep side or right in the middle: it’s just a case of trying them all to find out. Diving gannets and other seabirds are good indicators of fish near the surface; it generally means that predators are driving small fish upwards. If you see seabirds feeding, head for them, and you’ll be hard pressed not to catch something. Fish are creatures of habit, and tend to feed twice a day: at dawn and at dusk. So it follows that these are the best times to try to catch them. ‘Mackerel are easy to catch – they’ll eat anything!’ said Jon Holgate. True to form, we got three bites on feather lures within minutes of dropping the line and hauled in three reasonably-sized specimens. The NFSA (National Federation of Sea Anglers) recommends a minimum size to keep of 30cm. 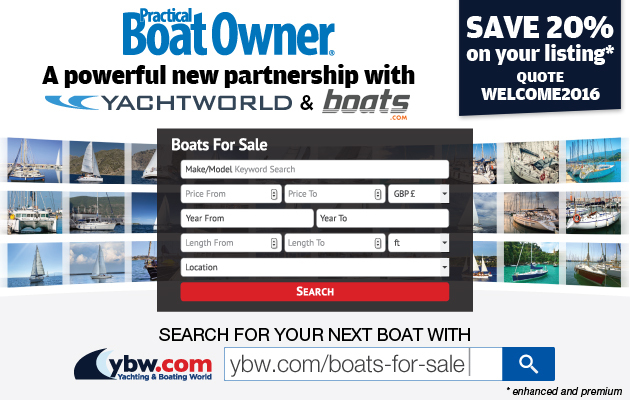 ‘The easiest way to catch mackerel on a yacht underway is with a paravane,’ said Jon. ‘You can throw it over the stern and forget about it.’ You need to be moving at 2-4 knots – any faster and the movement of the lures becomes unrealistic. The vane forces the line down, trailing the lures behind it, and will pop to the surface once a fish bites. It’s perfect for deploying over the stern and leaving while on passage, and works better at speed than a weight, which will pop to the surface if you travel too fast. For lures, use shiny spinners or feathers. Use a rig comprising a 4-6oz weight with feathers, or bait – we used squid on the hooks. Let it sink to the bottom then immediately wind it back up. Repeat the exercise as you drift with the tide. Make sure the line is oriented so that the lures are upstanding and fall away from the line. Upwellings, ledges, and sandbanks are good places for drift fishing, as are areas near forts and other large obstructions. Bass are powerful swimmers and as active predators will eat pretty much anything, from smaller fish to crustaceans, shellfish and octopus and squid. You’ll find them in most coastal waters around Europe. They often feed in shallow water, over weed, mud, rocks and sand on an incoming tide. Bass are slow-growing fish, and ever increasing commercial fishing pressures mean that populations have taken a dive over the past decade, so regulations are now in force to protect them. The NFSA recommends a minimum size of 41cm for bass. Some estuaries, including the River Hamble and Chichester Harbour, are designated bass nurseries, and purposely fishing for bass there is illegal. If you catch one accidentally, you must put it back. Fines of £750 plus costs for catching undersized fish are not unheard of. Much as for mackerel, a paravane works well, although it’s worth using bigger hooks and lures. 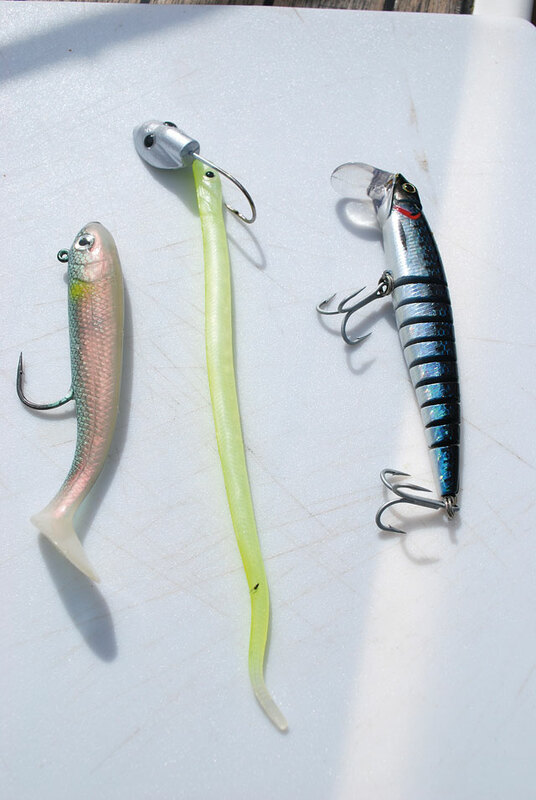 For larger fish, a lure that looks like a small mackerel is ideal – the one pictured on the right is known as a ‘mackerel killer’! Again, 2-4 knots is ideal for trolling. Bass do much of their feeding at night, so after dusk is a good time to catch them. 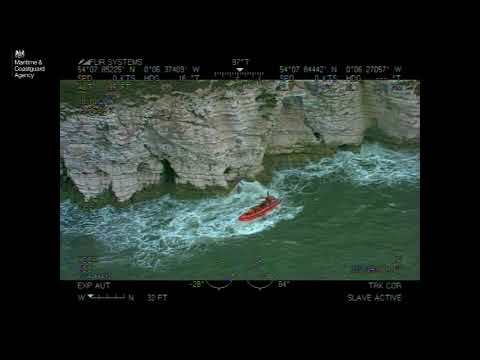 We used two different rigs, which we dragged slowly over Bembridge Ledge, drifting at around 1 knot over the ground with the tide in 4m of water. They consisted of a weight with a long ‘snood’ or line to a large hook. You can buy ready-made rigs from tackle shops. We baited ours with strips of squid. An alternative is to use a boom, which holds the snood away from the main line and prevents tangling. We used a fillet of one of our mackerel as bait. ‘The trick is to keep the weight just off the bottom,’ explained Jon. ‘The bait should trail slowly behind it.’ We lost a few rigs on underwater snags, and at one point I thought I’d caught a whopper, until it turned out to be a large rock. ‘You just need to be patient,’ said Jon, ‘but be ready to flick it off the bottom the second you feel it snag.’ We also caught two pollack and a pouting with the same rig, and this technique should catch you a variety of species, from bream to smoothhounds and other edible fish, using much the same kit. Deep wrecks are often home to larger fish, such as pollack and cod. Jon recommends the grinner knot – it’s easy to tie and is strong and secure. You don’t want fish scales, blood and guts splattered around the cockpit, and from the fish’s point of view, a quick demise is preferable. Have a bucket ready to hold the fish. 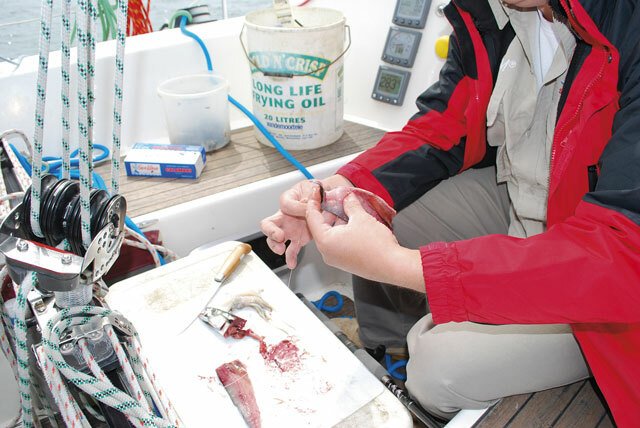 Many sailors pour alcohol into the gills – which is a quick and easy way of dispatching larger fish. For smaller fish, a blow across the back of the head with a priest (a heavy bludgeon) is easier. Alternatively you can just leave the fish in a box or bucket, but this is a slow and inhumane death. Conservation of fish stocks is vitally important to the future of fish species, so you should keep only what you are going to eat. Throw the rest straight back in to live another day. n This book, a general guide to fishing, offers excellent advice on rods, lines, lures, baits and techniques for catching and landing fish. The fish drawings above are used with the kind permission of the publishers. Thanks to Zebco Sports Europe, who supplied us with Rhino rods, reels and tackle for the day. This article first appeared in PBO in the August 2009 issue. You can download the article here as a PDF.